You know that you are flying into something special just by looking out the window of the airplane as you land at the Kona International Airport on Hawai’i, the Big Island. From those brief seconds upon landing, you see golf courses, lava fields, mountains, ocean waves and long endless miles of roads. Welcome to the Island of Hawai’i, also called the Big Island, a paradise that has just about everything you would want in a golf vacation. Terrific resort golf courses? Check. Some great public courses? Check. Plenty of beaches to enjoy the Pacific Ocean and its surfing and snorkeling? Check and check. The chance to tee off in the shadow of one of the tallest mountains – Mauna Kea? Check. Outdoor experiences like zip lining, bike riding, hiking and more. Check, check and check. And, the chance to see active volcanoes? Serious check. Other islands like Oahu, Maui and Kauai might get more headlines, but Hawai’i Island is a place where you get everything the islands have to offer – and less crowds. OK, there is one week where the crowds are big – and for good reason. The annual Ironman Triathlon is held in October every year and brings the top athletes to the island along with big crowds. But is certainly an event worth watching as the athletes swim 2.4 miles, bike 112 miles and run a 26.2 mile marathon all in the same day. And amazingly, the winner does it in around eight hours. 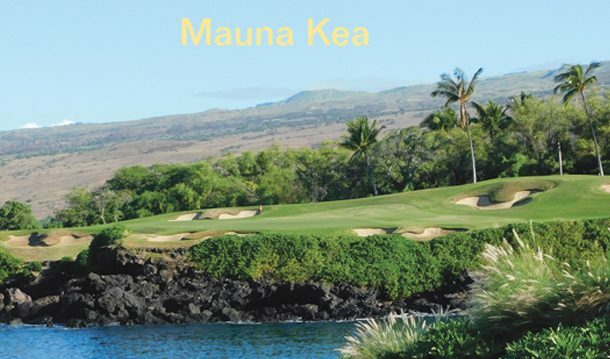 • It all started in 1964 when Mauna Kea was designed by Robert Trent Jones Sr. and opened for play. In fact, Jack Nicklaus, Arnold Palmer and Gary Player came over for an exhibition. Rumor has it during the round on the par-3 third hole, the three stood at the 272-yard tee box with the Pacific Ocean in front of them that Player told the other two he couldn’t carry his ball that far. There is a plaque on the tee box commemorating the exhibition that day. Right next door sits Hapuna Golf Course which features a dramatic course with plenty of holes up the hill and more down the hill toward the Pacific Ocean. • Many of the resorts sit along the ocean and offer terrific views. Waikoloa Beach Resort has two courses to offer, the Beach and the Kings’ Course. The Kings’ Course is embraced by natural lava formations so keeping the ball in the fairway is key. The Waikoloa Beach Resort is more than just golf as well. There are two shopping villages and two resorts – a Marriott and a Hilton. The Hilton is so set on 62 acres and is so spacious that you can opt to take a tram or boat to get from one side of the resort to the other. The Marriott features a spectacular setting along the beach. • Mauna Lani Resort is nestled between Waikoloa Beach Resort and Mauna Kea Resort and has two courses on site. Its signature 15th hole on the South Course is one of the most photographed holes in the world. In the winter, you might see humpback whales. Hualālai Resort’s Jack Nicklaus designed course is also the home of the Champions Tour in January. • Kona Country Club is another gem, having been closed for two years for an irrigation project but now opened and featuring some long par-3 holes and some terrific views along the ocean. • Inland, golf is still a treat. Makalei Golf Club, up the hill from the Kona Airport, just might be one of the hilliest golf courses around. In fact, the cart drive from the clubhouse to the driving range takes you up 750 feet. And wildlife abounds, including peacocks and wild boars. 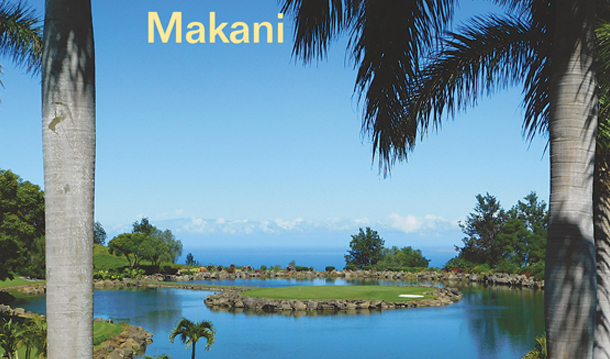 • Another course inland was called the Big Island Country Club but has now changed its name to Makani, which features wide fairways and water on half of the holes and a terrific island green par-3 17th hole and a dramatic finishing 18th. • And Waikoloa Golf Village sits at elevation and offers a Robert Trent Jones Jr. course with some scenic views of the ocean.